The February program page is up, so you can plan ahead for the month to come. Not to rush the demise of January, though. There are still some January events, which I've listed below. It may be the off-season at Pennsbury Manor, but that doesn't mean there's nothing going on. When there are animals to be cared for, that's a full-time, all-year endeavor. 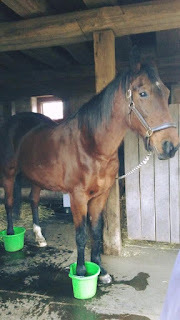 The Facebook post that carried the above photo noted that most horses do not cooperate as readily as TC with the hoof-soaking, intended to prevent bacteria from entering the freshly trimmed hooves. Winter has been fairly mild so far in the southeastern part of PA, allowing for more outside time for the animals and the people who take care of them. 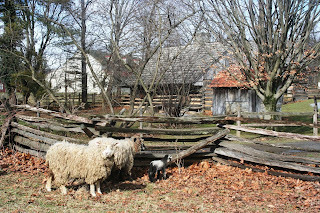 Landis Valley posted some photos of sheep, including a new lamb, enjoying the fresh air. We didn't compete in the #CuteAnimalTweetoff this week, but we'd have been heavy contenders if we had. The Anthracite Heritage Museum in Scranton recently hosted their annual commemoration of the Knox Mine Disaster, which took the lives of twelve miners on Jan. 22, 1959. This year's event included a tribute to Bill Hastie, 97, the last surviving employee of the Knox Coal Company and an active speaker on the history and legacy of the disaster. An article in Wilkes-Barre's Times Leader has photos and a full description of the program. 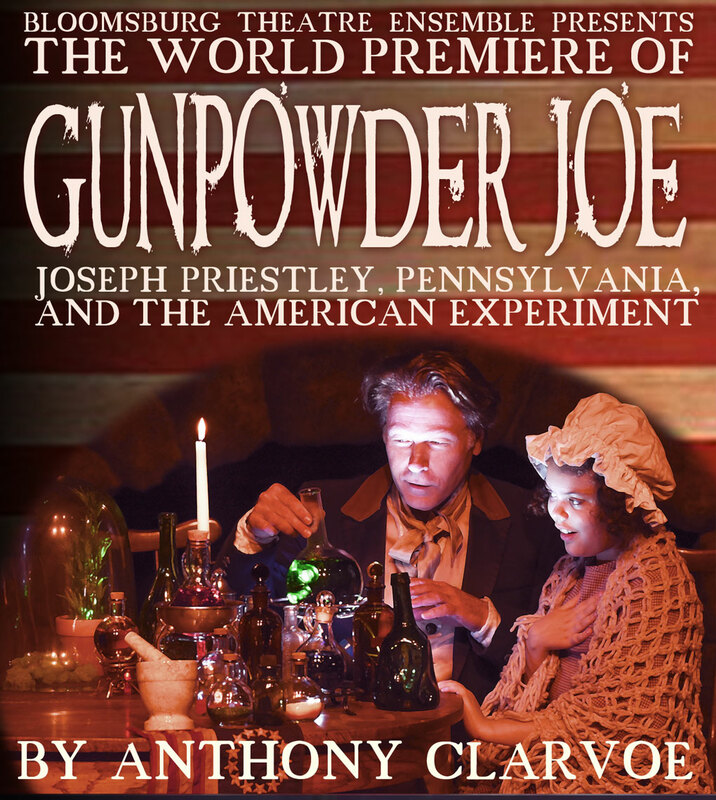 The Times Leader also reviewed the premiere of Gunpowder Joe: Joseph Priestley, Pennsylvania, and the American Experiment, a new play by Anthony Clarvoe, now in performances at Bloomsburg Theatre Ensemble, through Feb. 5 (so still time to see it). An article in the Sunbury Daily Item explores some of the historical themes (political, religious, and scientific) and personages portrayed. 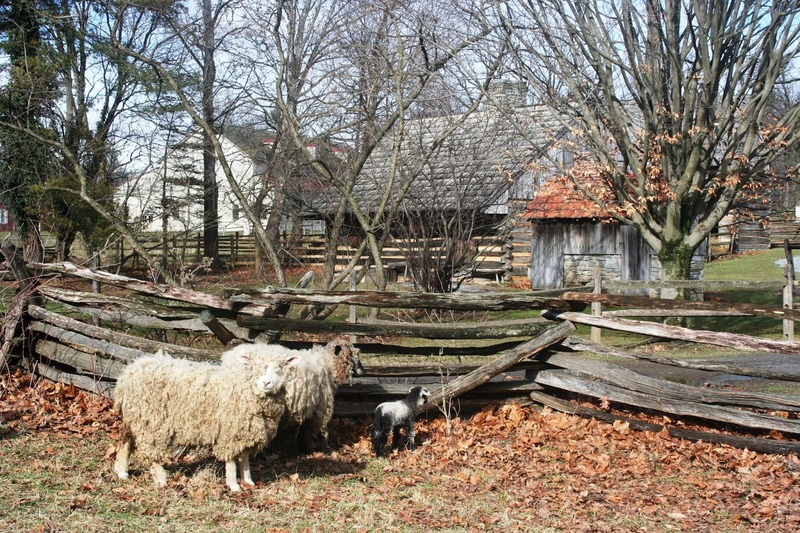 Some of the action is set at Priestley's home in Northumberland, which is part of the Pennsylvania Trails of History. State Museum of PA Nature Lab program, "White-Tailed Deer," 11:30 am-12:30 pm. Drake Well Museum's Something More Saturday has a Valentine's Day theme, "Love Among the Derricks." More info. 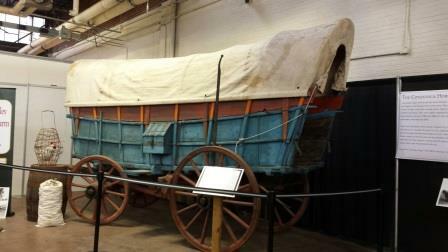 Fort Pitt Museum reopens after being closed most of the month for annual upkeep and cleaning. UPDATE: You can meet artists Dominick Brandt, Ralph Hocker, and Don Lenker from 2 to 3 pm at the State Museum of PA. They are featured in the current exhibit, The 7 Lively Artists, which closes on Feb. 12. Included in regular admission. The January program page has info on upcoming events. My Twitter feed yesterday included a tweet from PA Museums (statewide association of museums and historical organizations) retweeting PA House Majority Leader Rep. Dave Reed (R-Indiana County), who shared historian Michael Beschloss's tweet of the oldest known photograph of a presidential inauguration. The photo, in the collection of the Library of Congress, shows the 1857 inauguration of PA's only president, James Buchanan. Rep. Reed noted that Buchanan's home, Wheatland, is open as a museum in Lancaster. The New York Times recently featured an article, "From Mystery to History: Pennsylvania's Bygone Lumber Industry," exploring the photography of William T. Clarke, who documented life and work in the lumber region in the late 19th and early 20th centuries. 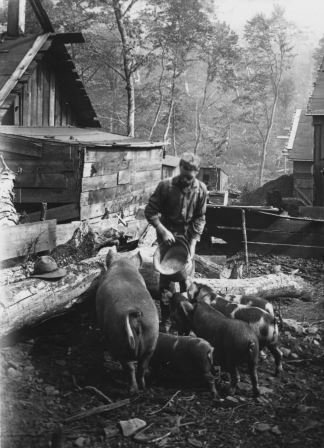 Clarke's work is the subject a new book, Wood Hicks and Bark Peelers, by Ronald E. Ostman and Harry Littell, published by Penn State Press in collaboration with the Pennsylvania Lumber Heritage Region and PHMC. Linda Ries, formerly on staff at the PA State Archives, worked with the authors to identify Clarke's work and research his biography; Ries also wrote the intro to the book. The State Archives holds a significant collection of Clarke's glass plate negatives and prints, and we used quite a few Clarke images in the "Challenges and Choices" exhibit at the Pennsylvania Lumber Museum. The Times article includes a slideshow of images from the State Archives and other repositories. Littell and Ostman's book is available from Penn State Press, online retailers, or at the Pennsylvania Lumber Museum. "This isn’t a formal presentation; rather it’s a “chat” with the creative team (actors, designers, playwright, director, composer, choreographer, Priestley electricity machine builder, Bucknell engineering student Eli Raeker-Jordan), our consultants (Dee Casteel and Pat Martino, Chemistry Department, Joe Tranquillo, Engineering Department, Bucknell) and others (Priestley scholar Mary Ellen Bowden from the Chemical Heritage Foundation, Tom Bresenhan of the Friends of the Joseph Priestley House, and there’s a very slim chance that Steven Johnson, author of THE INVENTION OF AIR, might show up!)." I'll note that Dee Casteel is the current president of the Friends of Joseph Priestley House and Pat Martino is a board member. 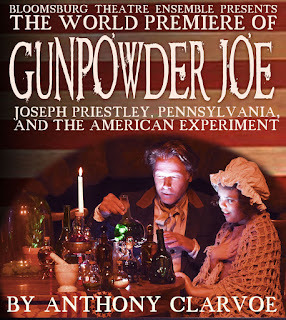 The play runs through Feb. 5; tickets are available on the Bloomsburg Theatre Ensemble website. PHMC's Keystone Summer Internship Program is currently accepting applications for the 2017 program, which runs from May 15 to August 4. 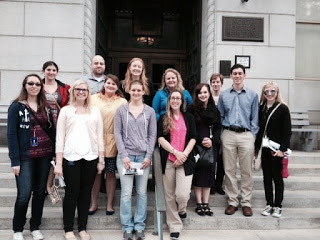 Internships provide an opportunity to network with public history professionals, explore career options, and complete a project that advances their interests as well as PHMC's. (Not to mention a chance to write for Trailheads - that's the real prize.) Keystone internships are unpaid; students must be enrolled in an undergraduate or graduate program and are strongly encouraged to pursue academic credit through their home institution. Applicants are asked to specify their areas of interest and/or preferred location (in Harrisburg or at one of the Trails of History sites). Initial review will match applicants with potential mentors, who will contact students for interviews. The application deadline is Feb. 10. More information, including the application form and list of other materials required (essay, transcript, and letter of recommendation), is available on PHMC's website. The January program page has info about events and programs on the Trails of History. Most sites will be closed on Monday, Jan. 16, for the Martin Luther King, Jr., holiday. The Railroad Museum of PA and Washington Crossing Historic Park (Visitor's Center only) (nope, sorry) will be open (please check their websites for hours). There's still time today and tomorrow (Jan. 13-14) to catch PHMC at the PA Farm Show. Check out last week's post (most-read Trailheads post ever!) for details. Hard to see here, but this is a bill of lading for a load of goods sent via Conestoga wagon from Lancaster County to Frederick Rapp in Economy, PA (at what is now PHMC's Old Economy Village). Cool connection! The PA Military Museum (Boalsburg) will be the venue for a Town Hall Meeting on Tues., Jan. 17, from 4 to 5 pm. The meeting is one of many planned around the country by the US Dept. of Veterans Affairs to provide opportunities for veterans, their families, and the general public to provide direct input to the VA. A post on StateCollege.com has more info. For directions to the museum, check the PMM website. 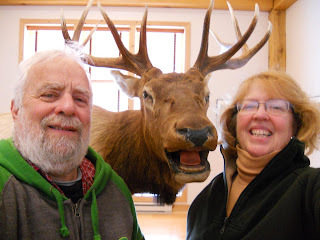 Wednesday, January 18, is international @MuseumSelfieDay on Twitter, and many of PHMC's Trails of History sites will be taking part. If you're at one of our sites that day and you're on Twitter, please take a selfie, post it using the hashtag #MuseumSelfie, and if possible tag the site you're visiting (not all have Twitter handles but many of them do). If you're looking for stuff to do on the Trails of History, please check out the January program page. I've added a few items since first posting the list in late December (and I'll continue to update as I get new info). Well, it's PA Farm Show time again, campers, and although this year doesn't have quite the buzz last year's 100th Farm Show had, there's still plenty to be excited about. This year's theme is "A Culture of Stewardship," and once again, staff and volunteers from all over PHMC will be on hand to help thousands of people learn about Pennsylvania's agricultural heritage and the work our agency does all year. The Farm Show opens to the public tomorrow, Jan. 7, and runs through next Saturday, Jan. 14. You can find all the info you need, including the Visitor's Guide, on the official Farm Show website and follow @PAFarmShow on Twitter (use #PAFS17 to tag your photos or see what other people are tweeting). UPDATE: PennDOT has an online tool for checking traffic and travel routes for the Farm Show (use on desktop or download to mobile). Also, @PAFarmShow is tweeting updates on parking. 1) Landis Valley Village and Farm Museum is back with their Conestoga wagon and exhibitry on Pennsylvania's agricultural history. 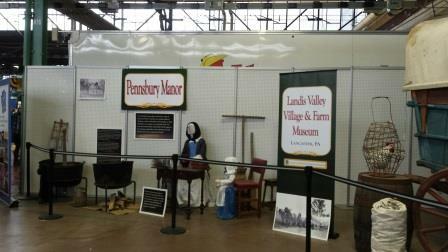 Landis Valley's exhibit area is in the Main Hall West, near the "Know Your Farmer" display. (The Main Hall is closest to the Maclay Street entrance to the Farm Show building.) They will be joined by folks from Pennsbury Manor who will share 17th-century farming and gardening history, including Pennsbury's now-famous beer-brewing program. 2) The State Historic Preservation Office and Pennsylvania State Archives will be in Main Hall East, Booth MF6086 (across from the Carousel, near the Family Living display). Look for the "Find Your Story" banner to learn about the treasures found at the State Archives, explore the Pennsylvania Agricultural History Project, or get started on the Historical Marker Scavenger Hunt. 3) Next door to "Find Your Story" in Booth MF6090, you will find the State Museum of PA's replica dugout canoe and a life-size photo mural of Native American petroglyphs found near Safe Harbor on the lower Susquehanna River. As always, archaeologists and others will be on hand to share their knowledge. 4) What would a trip to the Farm Show be without a look at the butter sculpture? Also found in the Main Hall, this year's offering, created by Jim Victor and Marie Pelton (Montgomery County) from 1,000 pounds of butter donated by Land O'Lakes (Carlisle, PA), is a tribute to environmental stewardship. It shows a lovely and very detailed agricultural landscape, a bit of a departure from the usual human and animal figures. When the Farm Show is over, the butter will be sent to a dairy farm in Juniata County where a methane digester will convert it into enough energy to power the farm for three days (read more and see a photo). **This claim has not been scientifically verified.